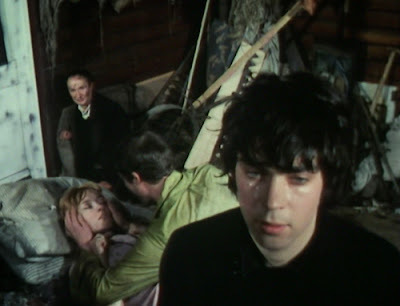 The recap notes that Roger’s mind is full of Margaret’s “minor sarcasms about the Birmingham Belle” but this is another instance where the specifics of his malaise passed me by, if they were identified. It makes more sense that the main reason for his disturbance is the role-playing he has been caught in. Behind the stable door Roger discovers a stuffed owl in a glass jar (“Bubo Bubo Bubo”), a collection of paper owls “tea party” made by Nancy and Bertram’s motorbike. One might question why Nancy left all this “evidence” behind if it so unnerves her. As with the plates, why didn’t she just destroy them; perhaps this is addressed in the novel. 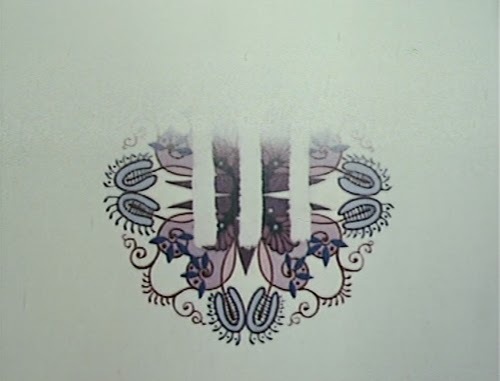 The line up of paper owls brings to mind the aliens from Quatermass and the Pit, which is perhaps appropriate (strange, ancient mysteries). Nancy’s crazed entrance, sending feathers flying everywhere as she smashes the owl case and evicting Roger (“What do you want?”), sets the tone for the dramatics that follow. She comes on like Mrs Danvers from Rebecca, bewitched by the earlier tragedy that played out around the house. Where Huw previously came across as a cracked sage, now a decidedly less benign bent is apparent. He sees it as his duty to ensure the legend is reenacted and goes to the lengths of having village kids chop down a telegraph pole. 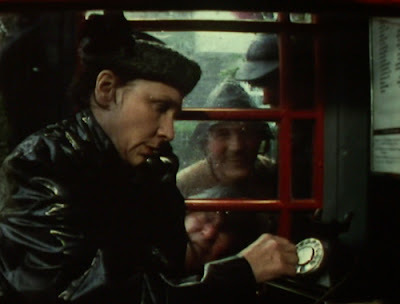 Nancy cannot call a taxi to leave, and by implication Gwyn is also marooned in the village with her. But he’s already decided to stay with his dad. For all Nancy’s hyperbolic ranting, she shows the most acute understanding of the imminent dangers. Her sin is in keeping it all (or most of it) to herself; the last we see of her is heading out of the village on foot. Huw finds Alison, again dressed in red (I wonder if Nic Roeg saw this prior to making Don’t Look Now? ), and she shelters from the storm in his rundown living quarters. Again, the divergent values of the rich and poor are highlighted, but Huw sees himself as rich; he has all the valley to keep things in. When he gives her the owl pendant, Alison succumbs to a teatime version of The Exorcist possession. This is strong stuff; the claw marks that appear on her face and the writhing of her bare legs. And Huw, the puppet master, demands that Roger “Go fetch the boy”. Wallis proves a master of stunt acrobatics as he careers from the shack and cascades around in the mud. I was surprised by how the climax unfolds. Roger is offered redemption and maturity while Gwyn sinks into the same morass that did for Huw. 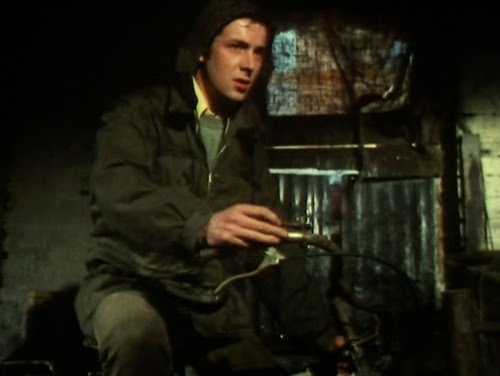 Arriving at Huw’s hovel, he refuses the call to aid Alison (“Help her!” pleads Roger). 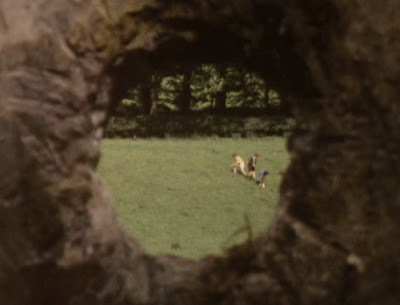 Instead, he unleashes the same immature barracking that Roger resorted two episodes previously; in his own way he is as gripped by the legend as Alison. And, in response, Roger shows pity (“You poor devil”). One might argue that the solution is all too simple, but it resonates for that very reason; the pattern on the plates that began her slide represents both owls and flowers, and Alison, the “silly gubbins” is told she’s never been anything else but flowers; “What made you think they could be anything else?” Most significant is the surprise registered by Huw (apparently the novel also identifies Huw with Gwydion or, at least, that’s how Huw thinks of himself); it shouldn’t have been Roger. The legend has failed to win out this time. What’s one to make of the subtext of this? That Garner is implicitly confirming one can’t escape one’s upbringing? Gwyn is trapped by his heritage and turns inward. Garner has said that it wasn’t until he reached his forties that he came to terms with his issues over the education that set him apart from his background and family. In Gwyn’s case he is presumably unable to move on. Maybe he doesn’t end up working at the Co-op, since he has rejected his mother, but his father’s influence is unlikely to be any more affirmative. After all, if the reenactment of the legend carries on down through the bloodlines, it may well be one of Gwyn’s children we see approaching the stone in the coda. It will all happen again, as it has always done. 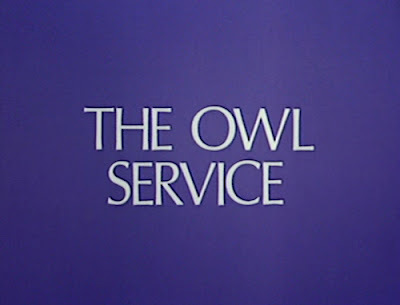 Perhaps not as iconic as Children of the Stones (another series that suggests a circular loop of intersecting past and present), but The Owl Service remains a potent tapestry of myth and mundanity. It is also strikingly untempered family fare. You can see why the DVD earned a 12 certificate. If the serial falters during the midsection, there’s no doubt that it rallies for a potent ending. Peter Plummer’s directorial choices aren’t always successful, but it’s his distinctive approach that makes the adaptation so memorable. And, if Michael Holden is the weak link, his fellow cast members make up for this; in particular Gillian Hills and Raymond Llewellyn. I’ve not seen the ‘90s adaptation of Elidor but Alan Garner, like John Christopher, is a “children’s” author long overdue for rediscovery through film and television.